This three-week online course is designed for business officers who oversee human resources as well as human resources professionals looking to conduct a self-assessment of their school’s human resources policies and practices. Independent school attorneys and authors of the NBOA publication Culture Meets Compliance provide a guided tour of the tools and worksheets in the book, and provide answers to critical issues facing independent schools. 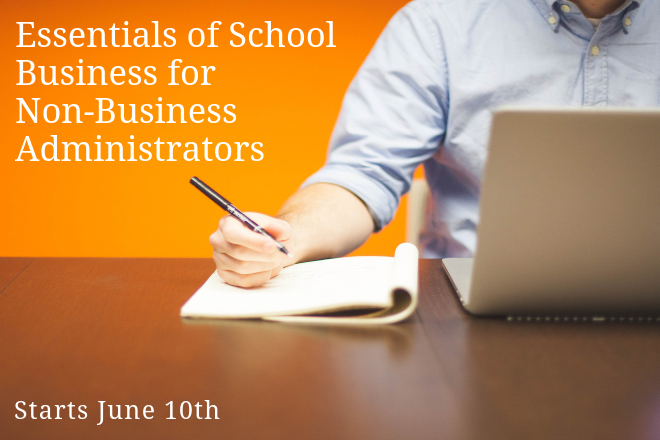 This four-week online course is designed for both business officers new to independent schools as well as the more experienced business administrator who wants to gain new insights. Participants share experiences of the ever-changing role of the business officer, from the day-to-day responsibilities to the strategic leadership role. Topics covered include financial planning and modeling, accounting and tax compliance, tuition and enrollment policies, human resources, risk management and facilities. This three-week online course is designed for those administrators who desire to be good stewards of their school's financial resources, to be strategic in light of financial pressure, and to work more collaboratively with their leadership team around financial issues. This four-week online course is designed for both human resources professionals and business officers who have oversight and responsibility for human resources. Participants will be empowered with the knowledge and tools to address day-to-day human resources challenges such as evaluation and termination, FMLA, the ADA and employee classification. Participants will gain knowledge to improve their policies and practices and know when to engage legal counsel. This three-week course is designed for business officers and/or controllers who want to customize NBOA's Long-Range Financial Model so they can spend more time using the data to make sound financial decisions for their schools. The course will provide you with a roadmap to tailor the NBOA Long-Range Financial Model to your needs. Course facilitators will guide you as you build and test your assumptions and learn to use this powerful planning tool. This three-week online course is designed for business officers seeking to use the Composite Financial Index (CFI) to develop and communicate a concise picture of their school’s financial health. The CFI can help schools take stock of past and current financial performance, forecast how the strategic plan will impact future financials and serve as a means to succinctly communicate a school’s key financial indicators. This three-week course is designed for business office and advancement professionals to understand best practices related to gift reporting compliance and donor transactions, as well as enhancing the strategic partnership between the two offices to ensure long-term success. Questions? Please email programs@nboa.org or call 202-407-7140. These programs are presented with generous support from TIAA.